Simon Cole never meant to get involved in British Intelligence, but when an operative is murdered in Lisbon, he is called in to solve the case. A writer who has some OCD tendencies and who has a love for collecting stamps, Simon leaves his comfortable world in London and travels to Lisbon, where the British embassy in Portugal is. 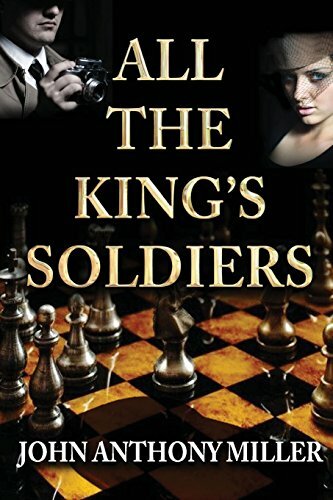 “All the King’s Soldiers” by John Anthony Miller follows Simon as he tries to deduce which of the his new fellow agents had a hand in the killing. Everyone is a suspect, including Maria, a young secretary at the embassy he quickly forms a relationship with. There is a double agent in Lisbon, and the fate of Britain may rest on finding out who it is when Simon finds the focus of the murder to surround the whereabouts of German invasion plans for Britain. “All the King’s Soldiers” is paced well and has chapters that are short and to the point, but filled with action and suspense as to build up to the climax of the story. John Anthony Miller has crafted a murder mystery that Agatha Christie would be proud of. There are so many possibilities as to who the murderer could be, yet when the killer is actually revealed, there’s no way to have ever seen it coming. The novel, written for a general audience, turns readers into spies as they work alongside Simon to solve the case. The setting and tone of the novel is appropriately tense for being set during World War II. The characters of the novel are thoroughly developed. They each have quirks which makes you have appreciate even the most despicable players in the book. Everyone has a dark secret to hide, and everyone is fighting in their own way for survival in the turmoil of the war. John Anthony Miller also has a knack for details. These are what make any story really pop to a reader. The appearances of the characters and their surroundings are described in a way that really brings the story to life on the pages. It also helps the mind notice when something is suspicious. Miller writes the story as if he were really Simon Cole, a spy, taking note of each detail for readers to tuck away in the backs of their minds for future reference. There seem to be no mechanical or editing errors in the writing, which means that the flow of the novel is not interrupted and readers can fully enjoy the content of the story. This is a novel that can be devoured in only a couple of sittings, as the fast and suspenseful pace build up further with each turn of a page. I would recommend “All the King’s Soldiers” by John Anthony Miller to anyone looking for a bit of a challenge for their mind. I loved getting the chance to slip into Simon’s world and feel like I was a part of the investigation. It made the reading of the book feel like a tangible experience, and that’s something that all readers can enjoy and appreciate.